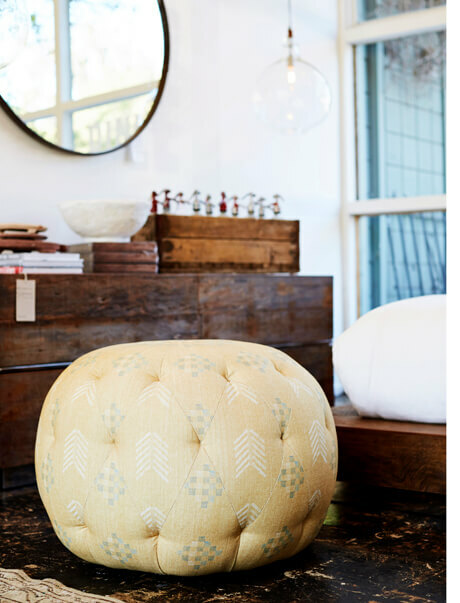 People often ask me where I shop for my clients – where I find great furniture, pillows, accessories and lighting fixtures. So, I thought it would be fun to take you along on some of my shopping trips and share my favorite spots. 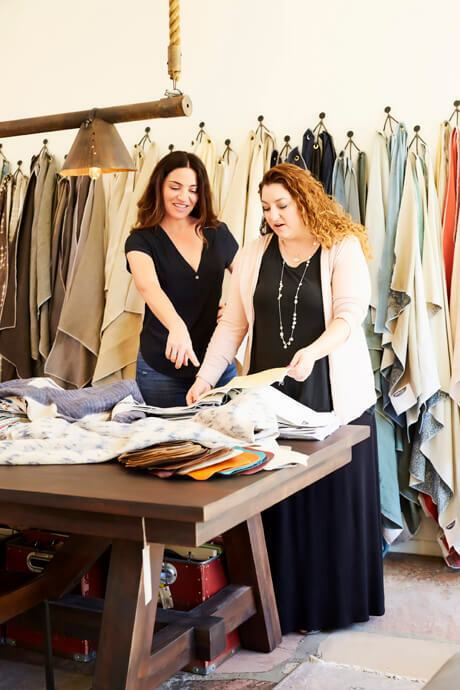 As a native Los Angelean, a busy mom and an interior designer who spends way too much time in my car, I feel like I’ve explored so many (but not all!) the different parts of this massive city. And each little pocket seems to have it’s own personality which is something I love about LA. As a designer, Los Angeles is one of the greatest cities I could ask for because there’s no shortage of creative people nor amazing decor stores. 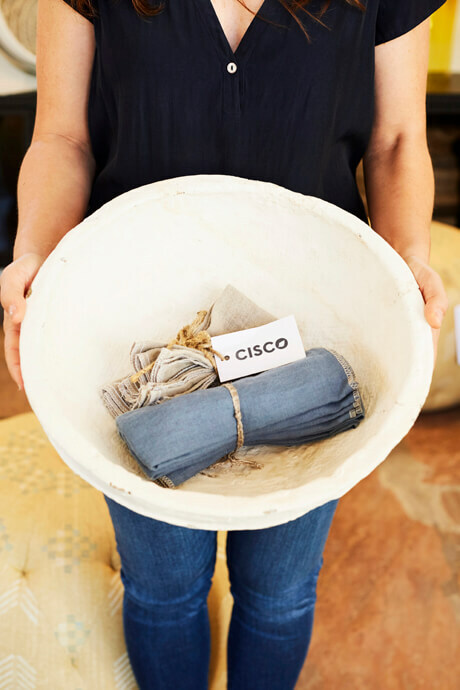 Recently, I made my way to Cisco Home, one of my go-to sources for sustainably made furniture, pillows, rugs, poufs and other statement-making accessories; there’s no shortage of great stuff here! There are several Cisco Home locations in Los Angeles, as well as one in the Bay Area and New York. I often shop at the Brentwood store, on beautiful treelined San Vicente Boulevard. 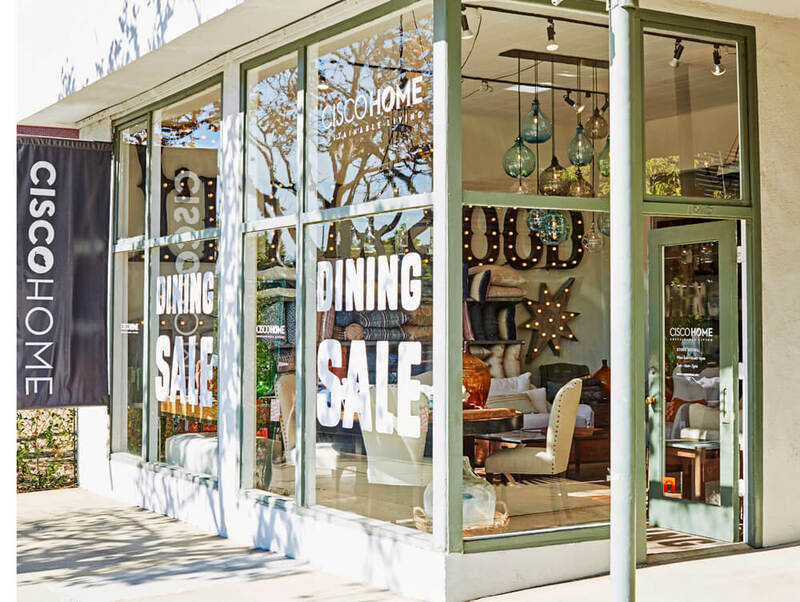 Brentwood is on the westside of LA, close to the beach, probably best known for it’s boutiques, restaurants and beautiful homes. It’s one of those neighborhoods that has it’s share of Starbucks and Whole Foods but still manages to retain a sense of old school charm. Places like the Brentwood Country Mart and Vicente foods have been there for over 50 years and are staples in the community. Cisco Home is located in a cool 1960’s mid-century building and is next door to Caffe Luxxe which makes a mean cappuccino if you’re in need of a pick-me-up. 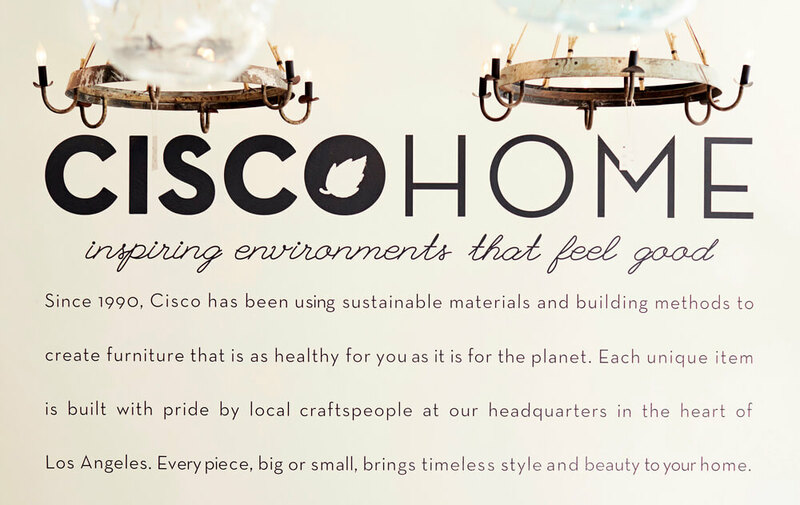 Cisco Home is a family owned and run business that makes sustainability and sourcing local materials a priority. It prides itself on using organic whenever possible so it’s a great place for people with allergies and those who care about minimizing their footprint on the environment—something I incorporate into my design as much as possible. Needless to say, I always feel good when I buy from them. 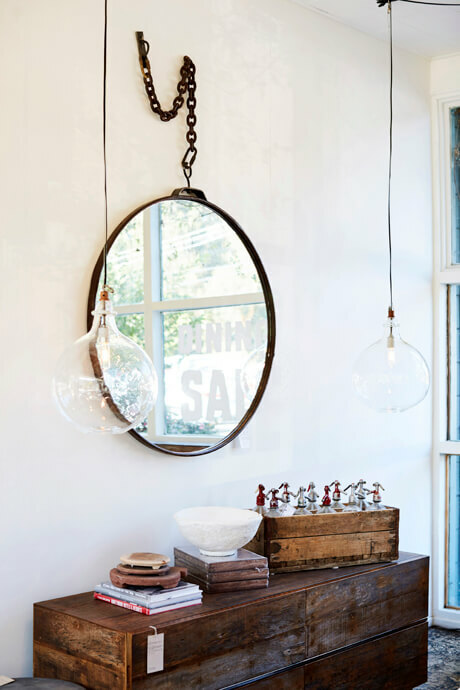 I find myself going back time and again for their accessories – if you need a pillow or mirror to tie your space together this is the spot to hit. 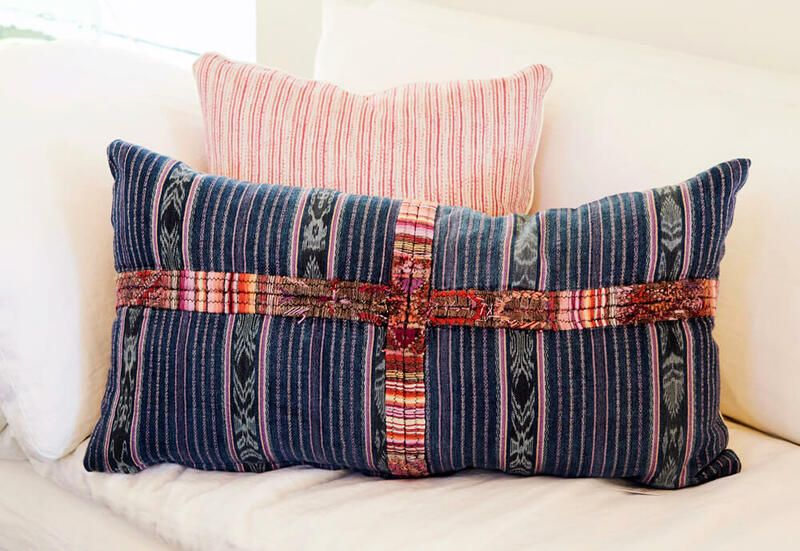 You may not think of a home store when you’re looking for a last minute hostess gift but their napkin sets are perfect and they always have a bin of sale pillows where I’ve scored some great deals. If you work up an appetite while shopping, you can head to Suzzane Goin’s Tavern or to La Scala for one of their famous chopped salads. 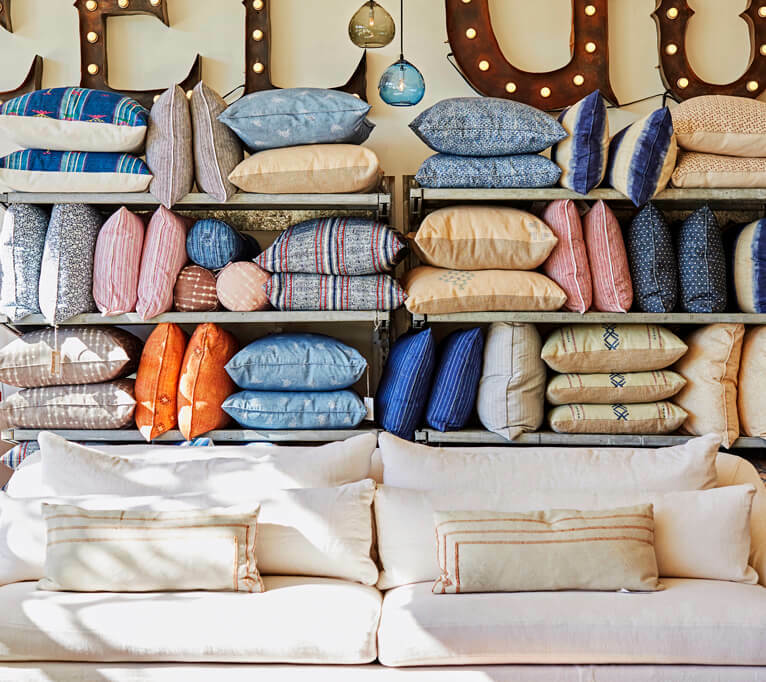 All of the Cisco Home stores share a beautiful and relaxed California aesthetic—you might not think you can be both laid back and pulled together at the same time, but Cisco nails this look perfectly. Think sofas in classic shapes and fabrics and pillows in unique textiles from around the world. In addition to the great product, the people that work at Cisco are such a pleasure and have the same down-to-earth and welcoming vibe as the stores–nothing is intimidating about shopping here. I’ve known Abby, the store manager, for years and she has a great eye and really “gets” what I’m looking for. Not to worry if she’s not around, all the staff at Cisco have design backgrounds and they offer complimentary interior design services as well. 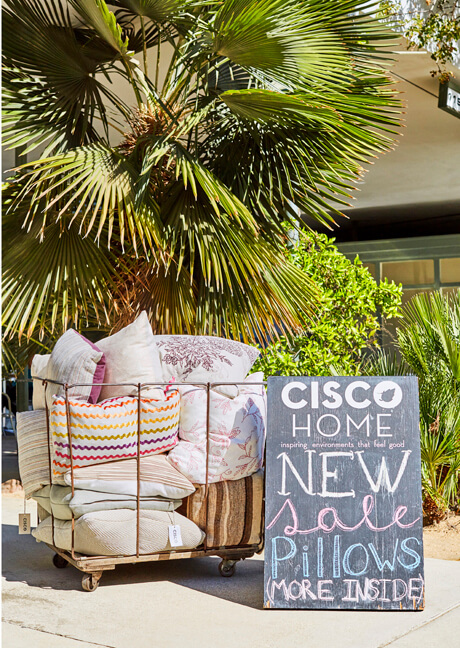 Cisco Home is generously offering our readers 20% off if they come shop and mention our blog. How great is that? Think of it as your designer discount 😉 so stop by the store and tell them we sent you!